Below, you can find a Holidays and Observances Alphabetical Listing of US Holidays and World Holidays and Observances that start with O. We are still adding names to the list, so more information will be coming. Organic Harvest Month is the Entire Month of September! I've been growing my own Organic Vegetables over the last couple of years. Not only does it save a lot of money, but there is nothing better than going outside to pick stuff for dinner! 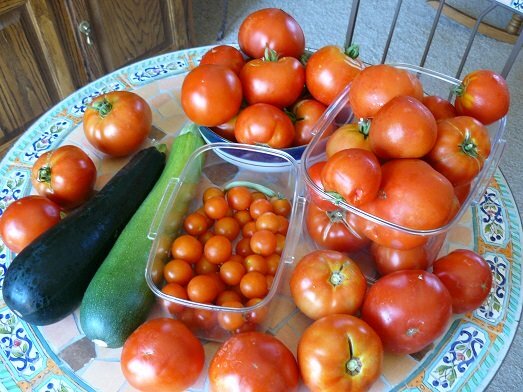 This was one day's haul - with this many tomatoes, I took off the skins and ran everything through my juicer. I was then able to freeze the juice/pulp in freezer quart size bags which are perfect for taking out to make pasta sauce or any type of soup. For excess zucchini - I peeled them and just grated them and put in freezer baggies to add to soups and sauces.